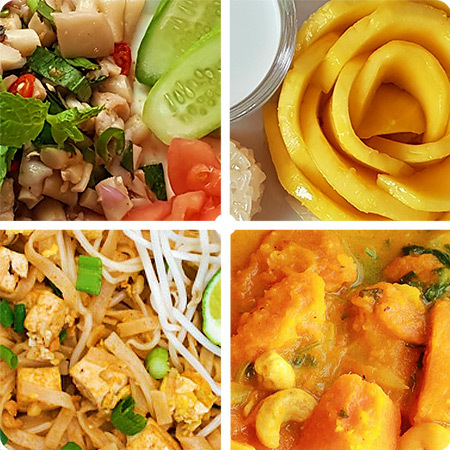 Welcome to My Thai Cooking’s vegetarian and vegan cooking classes in Bangkok, where you will learn how to make delicious vegetarian Thai food. We are happy to being able to offer a vegan and vegetarian cooking course using organic vegetables and ingredients to create amazing Thai dishes. If you wish we will also bring you on a tour of an organic fresh food outlet before the food preparation and cooking starts. Our private classes for vegetarian and vegan cooking are available for one person alone or for small groups up to 6 persons and include complementary pick-up/drop-off at Bearing BTS station. A class usually takes from 3 to 4 hours and you can freely choose 4 dishes from our vegetarian menu. NO meat, NO chicken, NO fish, NO prawns/shrimp, NO eggs and NO dairy. If you have some particular favorite vegetation Thai dish you don’t see in our menu, please contact us to inquire if it can be included. Price: 1.480 THB (47 USD / 41 EUR) Per person.